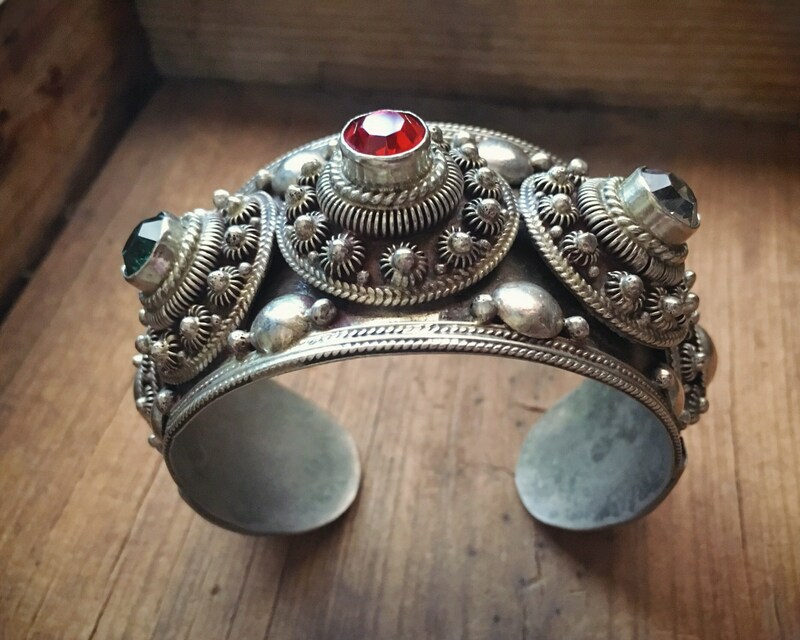 This is an amazing silver cuff--and even though the photos are good, the photos do not do justice to the glimmer and shine that is this cuff bracelet. 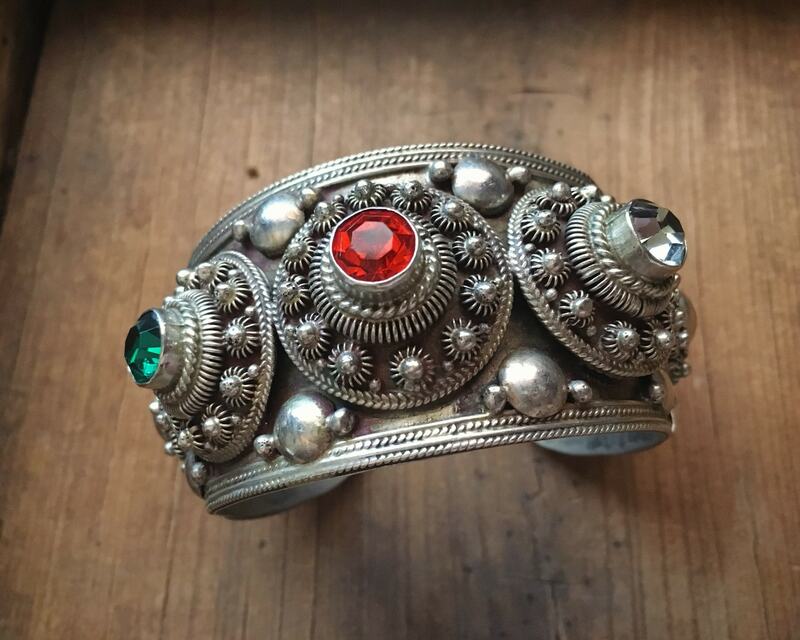 Marked SIAM STERLING on the interior, the piece is a cannetille silver bracelet from Siam, which is now Thailand. 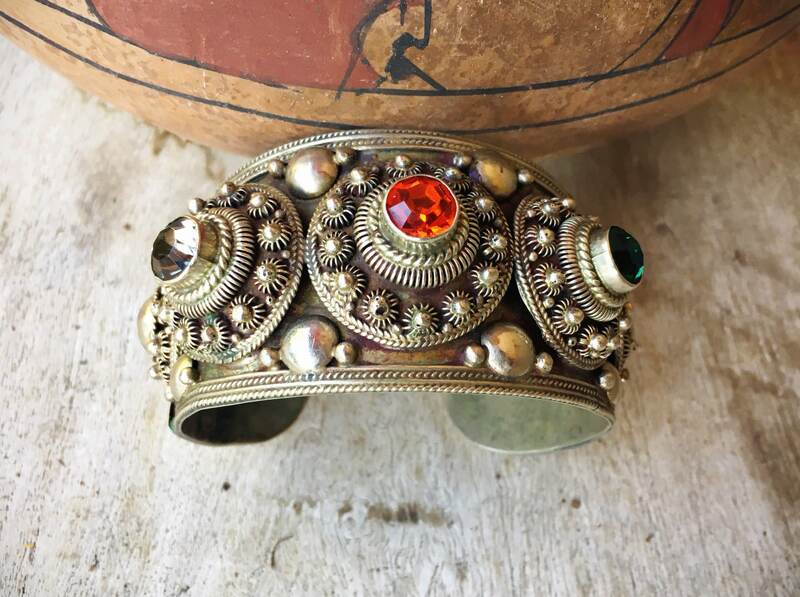 The hallmark MAY date the piece to pre-1939, when Siam became Thailand (then went back briefly in the 40s, and then changed for good in 1949). 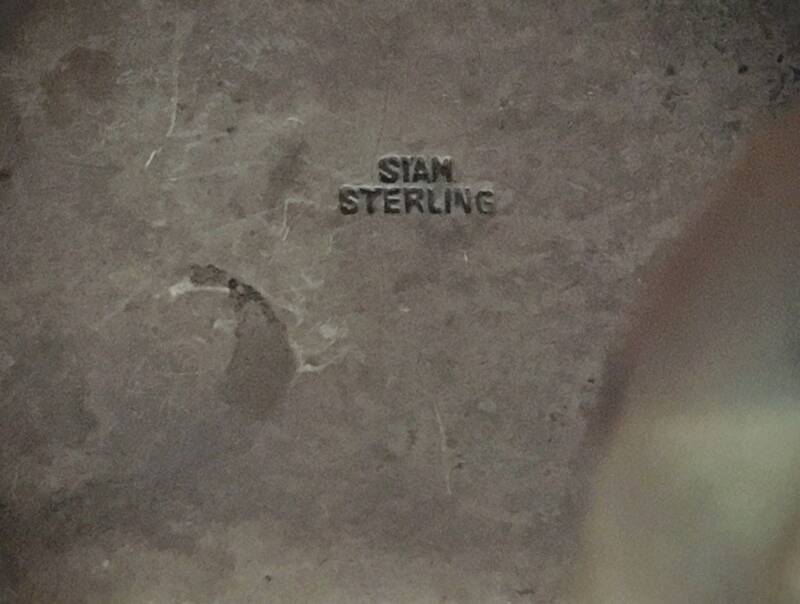 I say "may" because jewelry from this area sometimes still had the SIAM STERLING mark as a matter of identification--it was such a thing, the sterling silver from Siam. 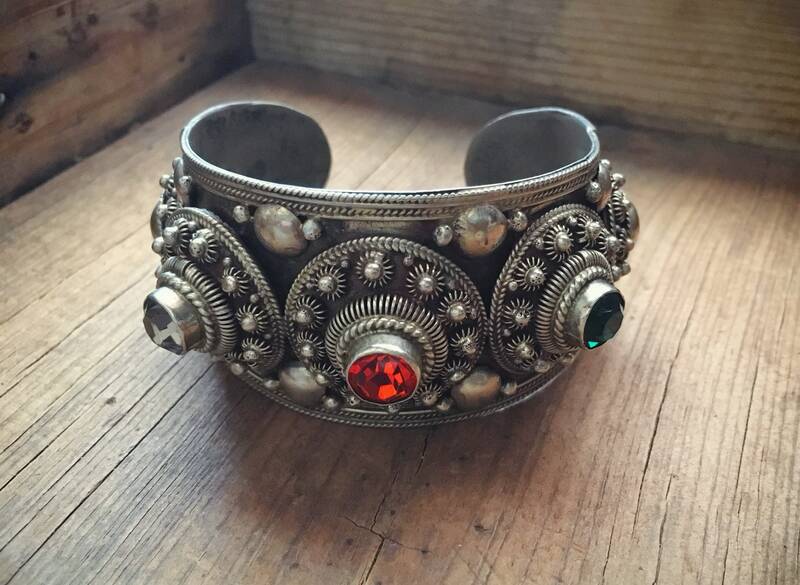 The main type of Siam silver that that known is nielloware, which is the black enamel with images of goddesses and other icons, but the particular style of this cuff bracelet is also something for which Siam silversmiths were known for. 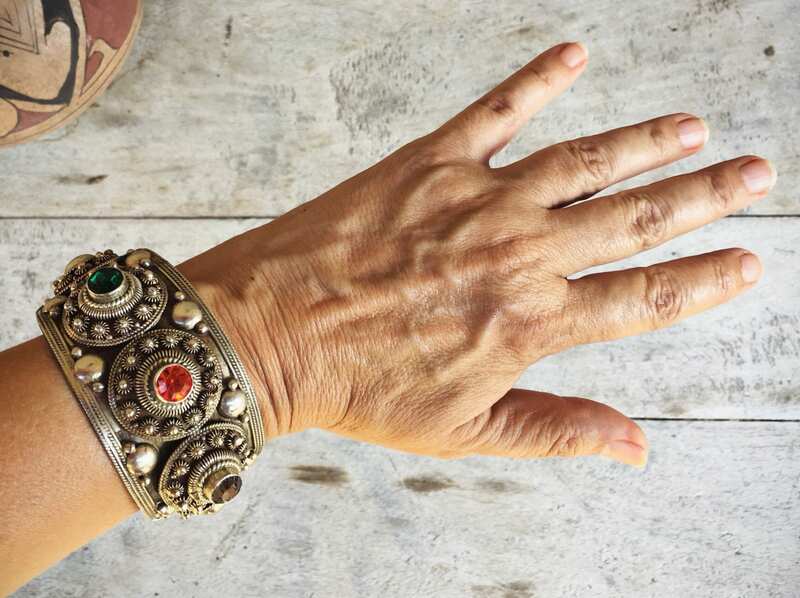 This piece came from the estate of a woman who is said to have purchased the piece in the 1940s, and for that reason we believe it is older and from Siam when Siam was the country. But we can't claim that with certainty. The three gemstones are synthetic to resemble diamond, orange garnet, and emerald. They are faceted and beautiful, with the orange especially sparkly. The three colors make them especially perfect for holidays, and the orange is deep enough that although it can't pass for red, with the clear and green on either side, it's a great Christmas piece. The cuff is large at 6-1/2" around taking a soft tape measure to the inside, plus a 1" gap for a total of 7-1/2" all the way around. Is 1-5/8" wide at the widest point. Perfect for someone with a wrist of about 7-1/4" to 7-1/2" (which you can measure by taking a soft tape measure all the way around). The silver foundation was made with two pieces of silver and a hollow interior, and there are a couple of spots where the silver top has dented. This is to be expected with age. 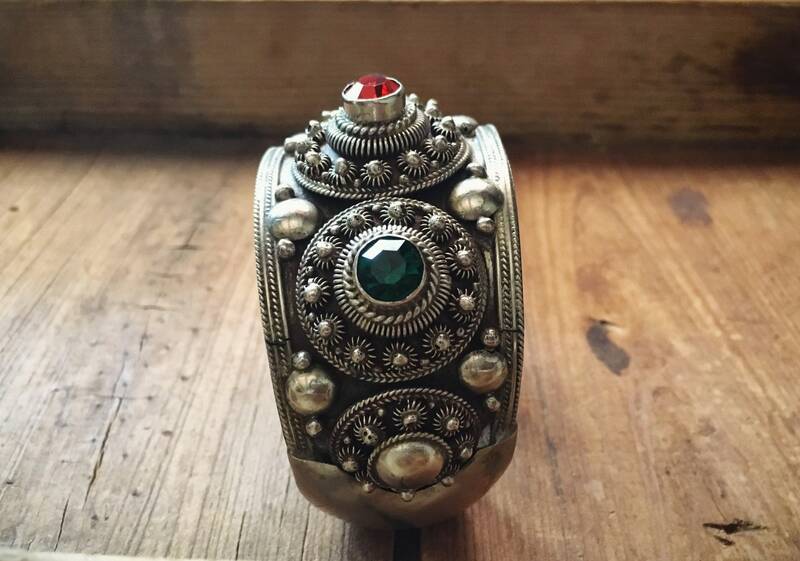 I have not cleaned the piece as the tarnish and patina show age. I will leave it to the next owner to decide to clean or not. 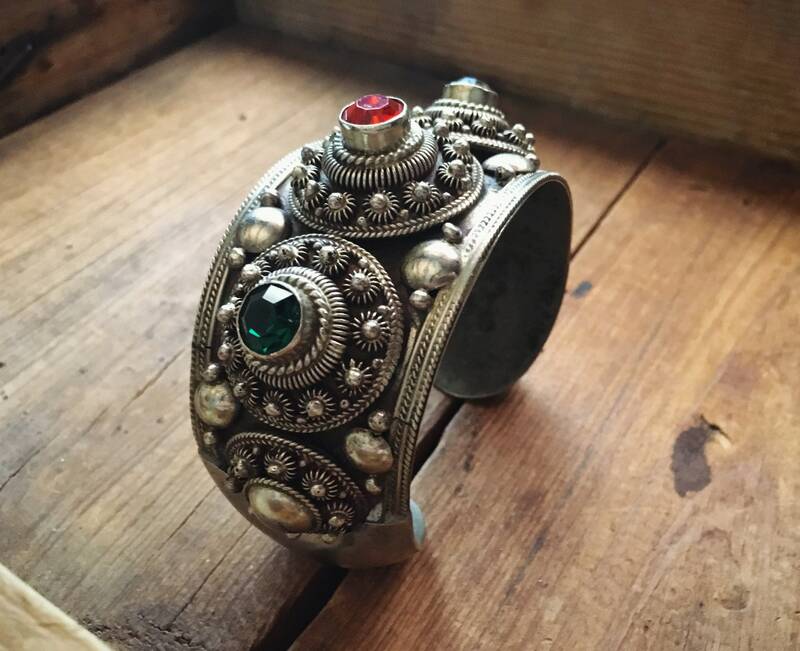 I like the darkness of the tarnish as it works beautifully with the ornate pointillist style of Cannetille to create depth. 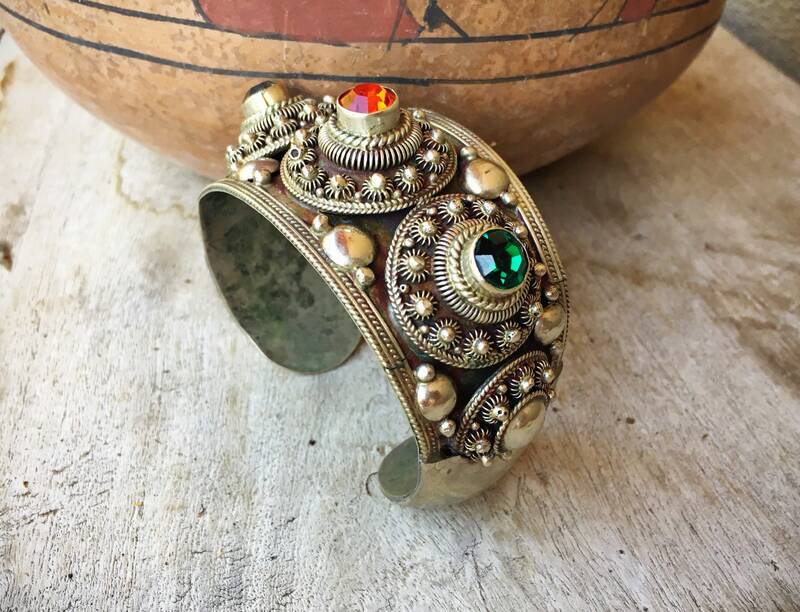 One might be tempted to squeeze the bracelet tighter or stretch it, but I would not as doing so will cause the cuff to become misshapen and compromise the settings. 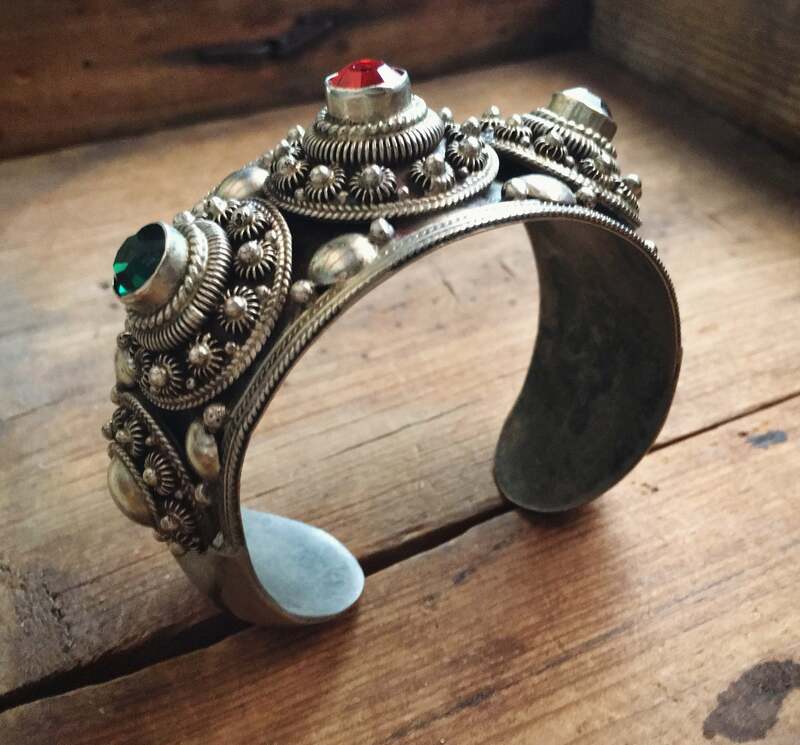 A very special piece, for a very special person.